Featuring a powerful quote from Ralph Waldo Emerson, this piece provides a reminder to forge your own trail. Featuring a powerful quote from Ralph Waldo Emerson, Mary Steratore's necklace provides the encouragement to take initiative in life, and in love. Green tourmaline promotes creativity, and smoky quartz calms to clear the psyche. The silver bar represents your path. 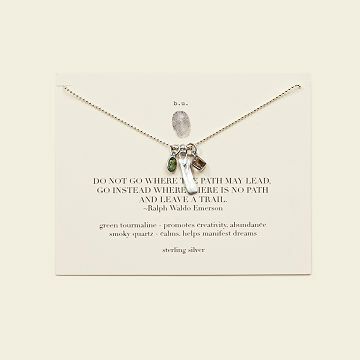 Comes with a card detailing the meaning behind each stone and charm. 16" chain has extra eye closures for adjustable lengths up to 18". Made in Italy, Thailand, India and the USA. Waxes and molds made Italy, silver charms cast in Thailand, semi-precious stone pieces made in India. The silver ball chains are made in USA and the final necklace is assembled and hand-polished in USA. Chain: 16" L extendable to 18" L, Charms: approx. .25" dia. Necklace was too short, much more like a choker. While I like the necklace, It does not hang as low as pictured. I will need a new chain to wear it, and for the price of this necklace that's rather disappointing. I figured the 16" length (or 18") was enough to make it hang where the picture was shown but if you do not have a thin neck then it's literally a choker (mind you, I don't have a fat neck, just a normal neck). Product was received as promised and was as advertised. I was very pleased with its timely arrival for the occasion of my granddaughter's college graduation and that it was promoted and pictured as it really is. Doesn't always work out that way and it makes Uncommon Goods an uncommonly reliable source for gifts! Product was just as described. Perfect. She loved it. Cash was going to be the gift of choice this Christmas until I came upon this exquisite piece. My granddaughter was thrilled with her gift. I Love this necklace. It is beautiful and I loved that it has meaning.